*This is a sponsored post written by me on behalf of Behr. All opinions are 100% mine. I’m so excited to kick off this new year by partnering with Behr on a project for their Behr Designer Stories series on the Behr.com website. My project for the series was all about taking a $5 Goodwill dresser from drab to fab in one weekend with Behr paint, and I’m thrilled with the results. When we lived in Illinois I found this awesome vintage Ethan Allen dresser at a local Goodwill shop for just $5. Sadly, it sat in our basement for months and eventually made it’s way down to North Carolina with us, with the hopes that I would find the time to give it a makeover. 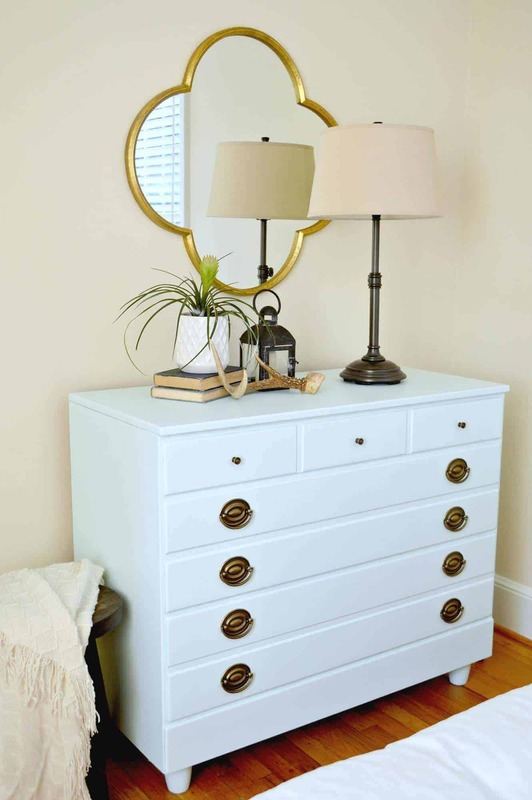 When Behr approached me to do a project for their Designer Stories series, I knew that the old dresser would be the perfect candidate and that it would finally get a much needed facelift. We live in a small home, with limited storage options, so the dresser is the perfect piece to makeover so that we could store our extra clothing. It was in fair condition, with a lot of surface scratches and it sat low to the ground, but it was solid (and did I mention cheap! ), so all it really needed was a fabulous new paint color and 4 sturdy legs to give it a brand new look. 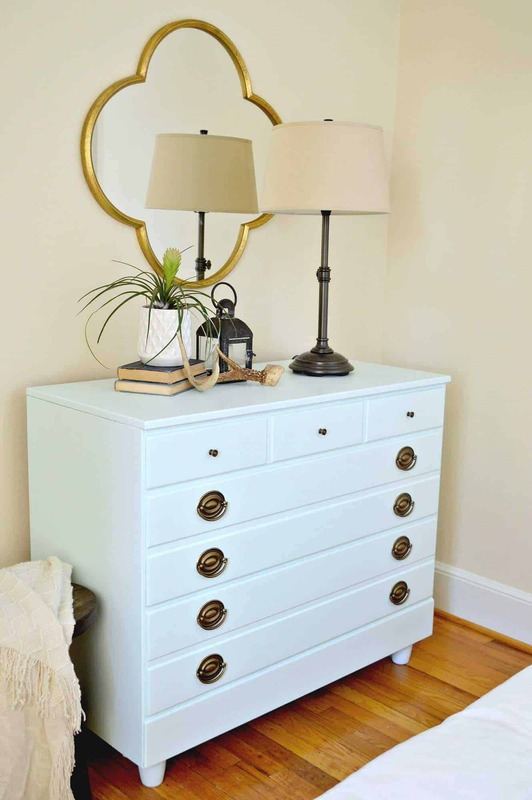 To get a fresh new look for this diamond-in-the-rough dresser, I chose Behr Premium Plus® Interior Satin Enamel Paint & Primer In One in “Sea Ice”. It’s my new favorite color! I love that I was able to completely transform this beat up $9 Goodwill dresser into a beautiful piece of furniture with paint. Not only is it beautiful but it gives us the space we need to store extra clothing. A win-win! If you head over to the Behr website you can see my completed project, here. Absolutely gorgeous and done in my favorite color! I think I suggested a similar color for your hallway…just saying that I can’t get enough of this color! ? 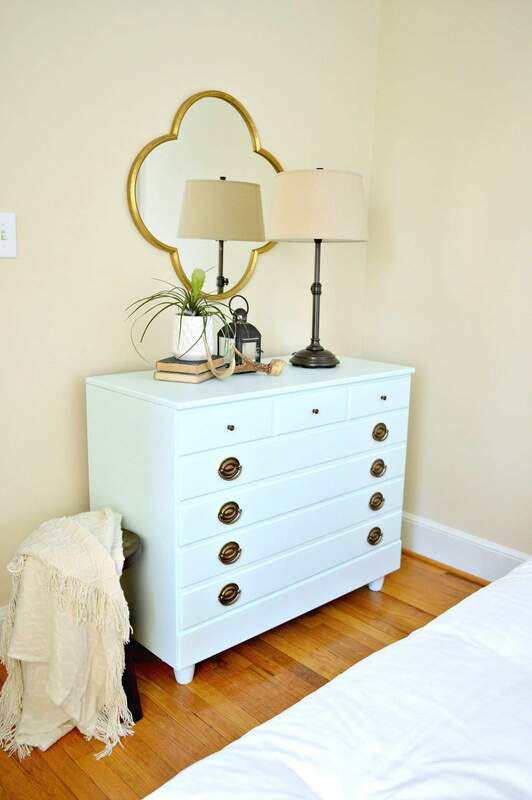 Seriously, I love that you let the color and simplicity of the dresser shine and didn’t stencil or distress it. Are you going to use the color elsewhere in the room? 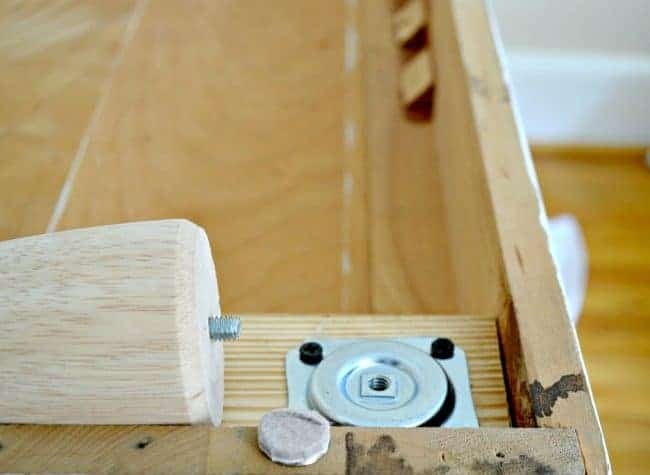 Are the drawer pulls on the top drawer(s) difficult to grasp? Thank you for your sharing your home with us! Thanks Lisa, I love the color too. I ended up moving the dresser to the other guest room, which needs a major makeover, so I’m not sure what my plans are. I’d love to use it again though. 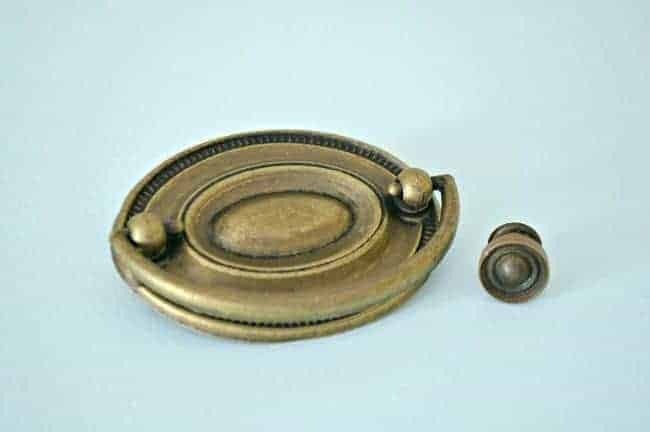 The drawer pulls on the top drawer are not difficult to grasp at all. I kept them because I liked their simplicity and they matched the new pulls on the other drawers. It looks very nice, and you did a great job. But why do people nowadays insist on painting over old wood? Wood is a natural material, and in many cases these pieces have a beautiful grain that can be enhanced. Even though people love concrete, stone, and other seemingly “natural” materials, they are very quick to obliterate wood. I love wood, and I love the warm look it gives. If this piece did not have a nice grain and good wood, then I understand. But I think it’s a shame to cover up good wood. Just my opinion. Thanks for your comment Colleen. I can’t speak for others but, as far as this dresser goes, I painted it because the wood was in pretty poor shape, as you can see in the before photos, and I love how it turned out after I painted it. My opinion on painting a piece of wood furniture is that each individual needs to do what they think is right for their piece. If you bought it, inherited it or even picked it up off a curb, you should do what you feel is best. After all, it has to live in your home so you should love it. Nice makeover. Thanks for joining us at the Inspiration Spotlight party. You are so right, Karrie! I have another one waiting on a color choice. There always seems to be a dresser project to do, right? Thanks for stopping in. Thanks so much, Lori. I love the paint color but I’m thrilled with the way the legs look. Visiting from Wonderful Wednesday…where is the final reveal of the dresser? I know it’s going to be pretty! You got that for a great deal. I hope you entered the $50 Home Depot gift card giveaway. Thanks for stopping in. What a nice project! Turned out great. I did come out really cute! I have a dresser to do over. I’ve used Behr paint before for my whole interior walls and would like to try it for furniture. Thanks Rosie. I love what Behr did for my dresser. If you like it on your walls, I’m sure you’d love it for your furniture. Love these kind of projects! You did a great job, it turned thank you for sharing! What a transformation. I love the new drawer pulls you picked out. The legs to raise it sure made a difference. Thanks so much, Cathy, I appreciate it. Nothing better than fresh paint. It looks beautiful, and the new legs give it a new life! Love the color you used on the dresser. I have been in a rut of always using white when painting furniture and need to try some fun new colors! I love the color too, Tina. I almost went with white, I’ve been in the same rut, but I’m so glad I tried something different. I love paint that does not require primer. Home Depot has become my home away from home, would love to win this one! Don’t you love what having an eye to see beyond what’s in front of you can do? Nice work on this piece. Thanks so much, Lynne, I appreciate it! I love Behr paint! I use it inside and outside my house. It is is the best! I use it for all kinds of projects, whether it is painting walls or painting furniture. Haven’t had the time to comment, lots of things going on. Hope you had a great Christmas and Happy New Year my friend! Looking forward to seeing more of your projects in the coming weeks. I agree, Behr paint is awesome!!! So nice to hear from you. Hope that you are well. Take care, my friend, and thanks for stopping in! 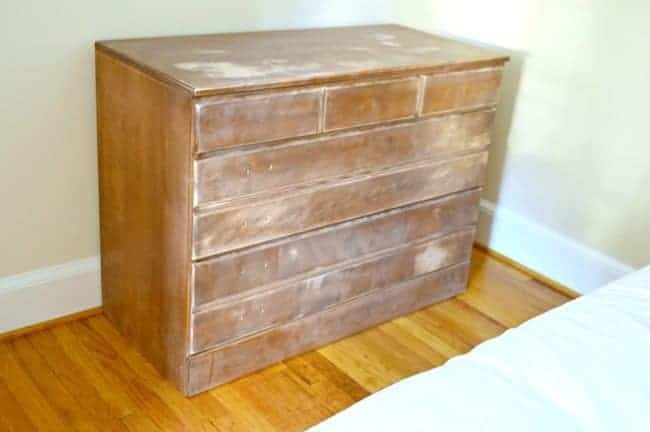 I live in Chicago and have a dresser like this in my daughter’s room that I have been afraid to paint because of all of the work. You make it look easy! Did you have to seal the top with any poly or anything? How long did you need to let the paint cure before you could put stuff back on the top of it? Thanks for the inspiration! I have used Behr paint in my home numerous times and have been very pleased. The dresser looks great! Thanks Suzanne. 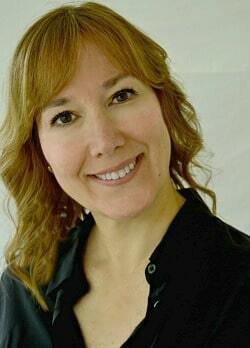 I love Behr paint and I’m glad to hear that you have had a great experience with it. Paint is the cheapest way to transform anything, from something small like a dresser to an entire house. Wow, what an amazing find for $9!!!! I love the paint color you applied and the hardware is perfect! What a great job, and great giveaway too, thank you for the opportunity! Thanks for your sweet comment, Kaycee. I was giddy with excitement when I saw that the dresser was $9. I haven’t found many deals like that before. I appreciate you stopping in and taking a look at my “new” dresser. Hope you have a great week! What a great redo. I love that you boosted it up on feet, what a great idea. I love Behr paints, they are my goto for redo’s. I painted my kitchen table and chairs in Behr and they have held up wonderfully for the past 5 years. Thanks so much, Samantha. I love that the new feet gave the dresser a different look and I loved using Behr paint. It will definitely be my go-to when I paint again. Glad that you have had a great experience with it. Omgosh. That colour is gorgeous. The dresser looks amazing. Great job! So many ideas here! Great transformation. Love it!! Such a sad looking piece. Now it looks so happy! Love the color. It was a sad looking piece, Iris, but I knew that it could look again. Thanks for visiting. I love the idea of giving new life of old, new paint is always a great way to go. I agree! 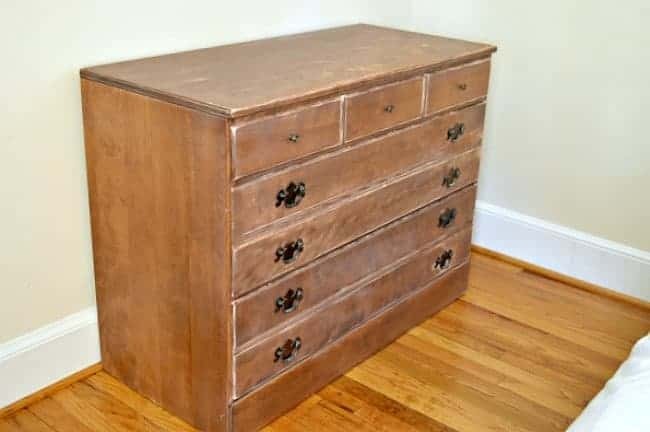 It’s really amazing how paint can truly transform an old piece of furniture. I love the color you chose ! It’s amazing how paint can change the appearance of a piece so much . Thanks so much, Bianca. Good luck!!! Lovely transformation, and sea ice is a lovely color! Thanks so much, Trisha. I’ve wanted to use this color for a while and I really love it. I’d love to have the Home Depot card 🙂 Home Depot is my own personal Money pit! Thanks so much, Allison, I appreciate it! Thank you for the tutorial and inspiration. I have 6 pieces of the Ethan Allen Heirloom and now have an idea of what I want to do with them! Wow, 6 pieces! Sounds like a lot of fun. 😉 I’m glad you were able to get an idea of what to do with yours. Good luck on your project. Love the color and addition of the legs. I have a chest I need to paint so thanks for the ideas. Thanks so much, Susan! I’m glad you were able to pick up a few ideas. Good work! I support reusing products rather than increased consumption. I have TWO chests I need to paint and your beautiful chest has given me the push I need to get started. I love the color but it was adding legs that give it the extra oomph! Great idea with the legs. Question, Why two boards to attach? Was it just to add more height? Going over to check out the finished product. I always use Behrs paint for the house. I like the quality finish it gives. Stay warm my friend. Hi Debbie. I guess my picture is deceiving…I used 1 board on each end. Sorry about that. Thanks for stopping in. Take care! I love using paint to change things! This looks beautiful, Kristi! You are always so creative! Awww, thanks so much, Kim, I appreciate it! I love turning junk pieces into glorious ones. Love the color. Me too, Rebecca! It’s so fun to see what you can do with an old piece of furniture. Love it. I may use that color in my bedroom. Very nice. I love the color. Looks like a new piece of furniture! Thanks, I love the color too. Looks wonderful! I like how you raised the chest up just that little bit with the legs. I never thought of adding legs with this approach. Great idea. Thanks! I’m really loving the legs and the way they changed the look of the dresser. Isn’t it amazing what a bit of time and paint can do? BTW welcome to North Carolina! It is amazing what a bit of time and paint can do. 😉 Thanks for the welcome, Susan, we are loving North Carolina! Great job! I, too, found an Ethan Allen piece similar to this at a garage sale, and I gave it a makeover. Still learning to use chalk paint… Seems that Behr leaves a beautiful finished piece (not discounting your wonderful skills). Did you use a primer paint? Hi Linda! The paint I used, Behr Premium Plus® Interior Satin Enamel Paint & Primer In One, had primer in it so I didn’t need to prime. Yay, one less step. 😉 Thanks for stopping in.